خدامرادپور, مهرانه, ایران نژاد, پرویز, اخوان, سمیرا, بابایی, خالد. (1396). ارزیابی مدل برف طرحواره سطح NOAH-MP جفت‌شده با مدل منطقه‌ای WRF در بارش‌های سنگین برف در شمال و غرب ایران. مجله ژئوفیزیک ایران, 11(4), 146-163. مهرانه خدامرادپور; پرویز ایران نژاد; سمیرا اخوان; خالد بابایی. "ارزیابی مدل برف طرحواره سطح NOAH-MP جفت‌شده با مدل منطقه‌ای WRF در بارش‌های سنگین برف در شمال و غرب ایران". 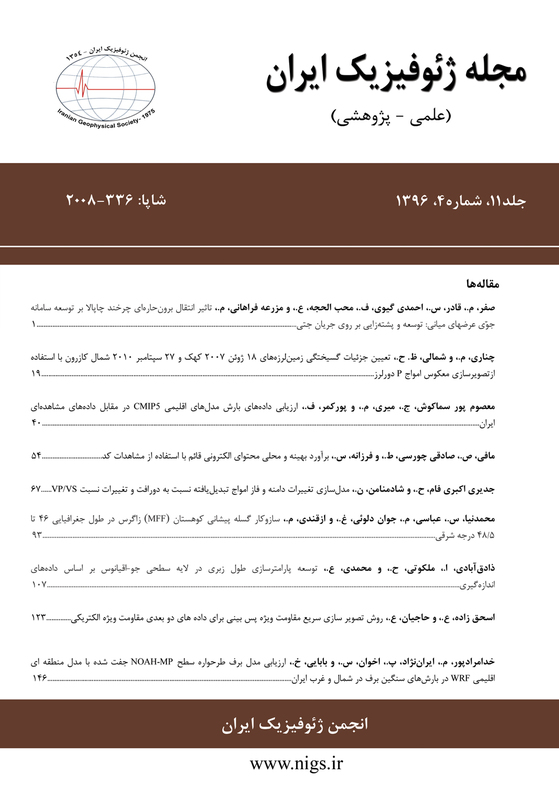 مجله ژئوفیزیک ایران, 11, 4, 1396, 146-163. خدامرادپور, مهرانه, ایران نژاد, پرویز, اخوان, سمیرا, بابایی, خالد. (1396). 'ارزیابی مدل برف طرحواره سطح NOAH-MP جفت‌شده با مدل منطقه‌ای WRF در بارش‌های سنگین برف در شمال و غرب ایران', مجله ژئوفیزیک ایران, 11(4), pp. 146-163. خدامرادپور, مهرانه, ایران نژاد, پرویز, اخوان, سمیرا, بابایی, خالد. ارزیابی مدل برف طرحواره سطح NOAH-MP جفت‌شده با مدل منطقه‌ای WRF در بارش‌های سنگین برف در شمال و غرب ایران. مجله ژئوفیزیک ایران, 1396; 11(4): 146-163. کسر پوشش برف، به دلیل افت‌وخیزهای شدید زمانی و مکانی، ضریب آلبیدوی بالا و رسانایی حرارتی بسیار کم نقش مهمی را در پارامتره­سازی برف در طرحواره­های سطح بر عهده دارد. این تحقیق به ارزیابی مدل برف طرحواره سطح NOAH-MP جفت‌شده با مدل WRF با فاکتور ذوب برف پیش­فرض مدل می­پردازد. منطقه مورد مطالعه نواحی شمالی (استان­های اردبیل، گیلان و مازندران) و غربی ایران (استان­های کردستان و همدان) است که به پنج ناحیه جنگلی، مرتع، پست و کم­ارتفاع و کوهستانی با شیب­های کم و زیاد تقسیم شد. مدل با گام مکانی 15 کیلومتر و 5 کیلومتر برای شبکه‌های مادر و داخلی، در بارش‌های برف سنگین در زمستان سال­های 2013 و 2014 اجرا شد و تصاویر روزانه سنجنده مودیس برای ارزیابی کسر پوشش برف استفاده شد. مدل در برآورد کسر پوشش برف و عمق برف در نواحی پست و کم‌ارتفاع با بالاترین ضرایب کارایی (به­ترتیب 64/0 و 37/0) و همبستگی (82/0 و 69/0)، کوچک­ترین خطای اریبی (4/2- و cm1/3-) و میانگین مطلق خطا (9/4 و cm5/6) بهترین عملکرد را دارد؛ درحالی‌که در برآورد کسر پوشش برف در نواحی مرتع و کوهستانی با شیب زیاد و عمق برف در نواحی جنگلی و کوهستانی با شیب زیاد، با منفی بودن ضریب کارایی، ناموفق است. عملکرد نسبی مدل در پیش­بینی وقوع بارش برف در اکثر نواحی، به­جز ناحیه مرتع با سطح مهارتی مناسب، در سطح مهارتی خوب است. مدل در برآورد کمینه دمای هوا در تمام نواحی، با مثبت بودن ضریب کارایی (محدوده 29/0 تا 88/0)، موفق است. نتایج این پژوهش بیانگر موفقیت مدل WRF-NOAHMP در پیش­بینی کمینه دمای هوا در تمام نواحی است؛ درحالی‌که هنوز هم در پارامتره­سازی کسر پوشش برف و عمق برف در نواحی کوهستانی با توپوگرافی پیچیده و دارای سطح ناهمگن و پارامتره­سازی برف تاج ­پوشش گیاهی دارای عدم قطعیت بالایی است. Land surface schemes have considerable significance in the regional climate models. Due to their role in both surface’s energy and water budget, snow processes are among the most important components of the surface schemes. Snow cover fraction, because of extreme temporal and spatial changes and various features, including high albedo coefficient and very low conductivity, plays an important role in the snow models. This research evaluates snow parameterization in the Advanced Weather Research and Forecasting model (WRF) coupled with the NOAH-MP as a land surface scheme, improved NOAH scheme, through the advanced canopy, snow, and runoff modeling. The snow cover fraction of this scheme is estimated through the hyperbolic tangent relationship between snow height, snow density, and snow melt factor. The snowmelt factor in this model is pre-determined as one since its calibration is difficult due to the lack of access to the observational data at weather stations, using satellite images, and lack of images at most of the snowfall time periods because of the cloud coverage in most parts. For this reason, in this research, the snow cover fraction is evaluated with the default snowmelt coefficient of the model. The WRF-NOAHMP model runs in two separate zones, the northern (Ardebil, Gilan, and Mazandaran provinces) and the western (Kurdistan and Hamedan provinces) regions of Iran, through one-way nesting method with the spatial resolution of 15 kilometers and 5 kilometers for mother and inner domains and during the several periods of heavy snow in the winter of 2013 and 2014. The daily Modis images of the Terra Satellite were used to evaluate the snow cover fraction. Based on the digital elevation model and land use maps, the study area is categorized into five areas, including forests, rangelands, low lands, and mountainous regions with high and low slopes. The WRF-NOAHMP model is successful in predicting the snow cover fraction in most areas, except mountainous areas with high slopes and rangeland areas; however, the model’s best performance is for low lands due to the highest efficiency coefficient (0.64), the smallest Bias error (-2.4), and Mean Absolute Error (9.4). Moreover, the skill level of the model’s performance (using the area under ROC curve) is good in predicting snowfall in most areas, except for the rangeland area. The WRF-NOAHMP is unsuccessful in estimating the snow depth in forests and mountainous areas with high slopes due to the negative efficiency coefficient, while it has the highest efficiency in estimating snow depth in low lands and mountainous areas with a low slope. Evaluation of the simulated minimum temperature by the model indicates the model’s success in estimating the minimum temperature in all studied areas because of the positive efficiency coefficients. The results of this study show the success of the WRF-NOAHMP in the prediction of the minimum temperature in different regions, while it still has a great deal of uncertainty in the parameterization of the snow cover fraction and the snow depth in mountainous areas with complex topography and areas with surface heterogeneity as well as the parameterization of the snow canopy. Anderson, E. A., 1976, A point of energy and mass balance model of snow cover: National Oceanic and Atmospheric Administration Technical Report, NWS, 19, 1-150. Baldocchi, D., Falge, E., Gu, L., Olson, R., Hollinger, D., Running, S., Anthoni, P., Bernhofer, C., Davis, K., Evans, R., and Fuentes, J., 2001, FLUXNET: A new tool to study the temporal and spatial variability of ecosystem–scale carbon dioxide, water vapor, and energy flux densities: Bulletin of the American Meteorological Society, 82(11), 2415-2434. Ball, J. T., Woodrow, I. E. and Berry, J. A., 1987, A model predicting stomatal conductance and its contribution to the control of photosynthesis under different environmental conditions: Progress in Photosynthesis Research, 221-224. Bonan, G. B., 1996, Land surface model (LSM version 1.0) for ecological, hydrological, and atmospheric studies: Technical description and user’s guide. Technical note (No. PB--97-131494/XAB; NCAR/TN--417-STR). National Center for Atmospheric Research, Boulder, CO (United States): Climate and Global Dynamics Div. Bowling, L. C., Lettenmaier, D. P., Nijssen, B., Graham, L. P., Clark, D. B., El Maayar, M., Essery, R., Goers, S., Gusev, Y. M., Habets, F. and Van Den Hurk, B., 2003, Simulation of high-latitude hydrological processes in the Torne–Kalix basin: PILPS Phase 2 (e): 1: Experiment description and summary intercomparisons: Global and Planetary Change, 38(1), 1-30. Brutel-Vuilmet, C., Ménégoz, M. and Krinner, G., 2013, An analysis of present and future seasonal Northern Hemisphere land snow cover simulated by CMIP5 coupled climate models: The Cryosphere, 7(1), 67. Chen, F., and Dudhia, J., 2001, Coupling an advanced land surface–hydrology model with the Penn State–NCAR MM5 modeling system. Part I, Model implementation and sensitivity: Monthly Weather Review, 129(4), 569-585. Chen, F., Liu, C., Dudhia, J., and Chen, M., 2014, A sensitivity study of high-resolution regional climate simulations to three land surface models over the western United States: Journal of Geophysical Research, Atmospheres, 119, 7271–7291. Chu, H., Baldocchi, D. D., John, R., Wolf, S. and Reichstein, M., 2017, Fluxes all of the time? A primer on the temporal representativeness of FLUXNET: Journal of Geophysical Research, Biogeosciences, 122(2), 289-307. De Bruin, H. A. R., Trigo, I. F., Bosveld, F. C. and Meirink, J. F., 2016, A Thermodynamically Based Model for Actual Evapotranspiration of an Extensive Grass Field Close to FAO Reference, Suitable for Remote Sensing Application: Journal of Hydrometeorology, 17(5), 1373-1382. Dickinson, R. E., Kennedy, P. J., and Henderson-Sellers, A., 1993, Biosphere-atmosphere transfer scheme (BATS) version 1e as coupled to the NCAR community climate model: National Center for Atmospheric Research, Climate and Global Dynamics Division. Douville, H., Royer, J. F., and Mahfouf, J. F., 1995, A new snow parameterization for the Meteo-France climate model: Climate Dynamics, 12(1), 21-35. Essery, R. L. H., Best, M. J., Betts, R. A., Cox, P. M., and Taylor, C. M., 2003, Explicit representation of subgrid heterogeneity in a GCM land surface scheme: Journal of Hydrometeorology, 4(3), 530-543. Hall, D., and Riggs, G., 2007, Accuracy assessment of the MODIS snow products: Hydrological Process, 21, 1534–1547. Huang, X., Liang, T., Zhang, X., and Guo, Z., 2011, Validation of MODIS snow cover products using Landsat and ground measurements during the 2001–2005 snow seasons over northern Xinjiang, China: International Journal of Remote Sensing, 32, 133–152. Klein, A. G., and Barnett, A. C., 2003, Validation of daily MODIS snow cover maps of the Upper Rio Grande River Basin for the 2000–2001 snow year: Remote Sensing Environment, 86, 162–176. Minder, J. R., Letcher, T. W., and Skiles, S. M., 2016, An evaluation of high‐resolution regional climate model simulations of snow cover and albedo over the Rocky Mountains, with implications for the simulated snow‐albedo feedback: Journal of Geophysical Research, Atmospheres, 121(15), 9069-9088. Maurer, E. P., Rhoads, J. D., Dubayah, R. O., and Lettenmaier, D. P., 2003, Evaluation of the snow-covered area data product from MODIS: Hydrological Process, 17, 59–71. Nash, J. E., and Sutcliffe, J. V., 1970, River flow forecasting through conceptual models part I—A discussion of principles: Journal of Hydrology, 10(3), 282-290. Niu, G. Y., and Yang, Z. L., 2004, Effects of vegetation canopy processes on snow surface energy and mass balances: Journal of Geophysical Research, Atmospheres, 109(D23). Niu, G. Y., Yang, Z. L., Dickinson, R. E., and Gulden, L. E., 2005, A simple TOPMODEL‐based runoff parameterization (SIMTOP) for use in global climate models: Journal of Geophysical Research, Atmospheres, 110(D21). Niu, G. Y., Yang, Z. L., Dickinson, R. E., Gulden, L. E., and Su, H., 2007, Development of a simple groundwater model for use in climate models and evaluation with Gravity Recovery and Climate Experiment data: Journal of Geophysical Research, Atmospheres, 112(D7). Niu, G. Y. and Yang, Z. L., 2007, An observation‐based formulation of snow cover fraction and its evaluation over large North American river basins: Journal of Geophysical Research, Atmospheres, 112(D21). Niu, G. Y., Yang, Z. L., Mitchell, K. E., Chen, F., Ek, M. B., Barlage, M., Kumar, A., Manning, K., Niyogi, D., Rosero, E., and Tewari, M., 2011, The community Noah land surface model with multiparameterization options (Noah‐MP): 1. Model description and evaluation with local‐scale measurements: Journal of Geophysical Research, Atmospheres, 116(D12). Roesch, A., Wild, M., Gilgen, H., and Ohmura, A., 2001, A new snow cover fraction parametrization for the ECHAM4 GCM: Climate Dynamics, 17(12), 933-946. Skamarock, W. C., Klemp, J. B. and Dudhia, J., 2001, Prototypes for the WRF (Weather Research and Forecasting) model. In Preprints, Ninth Conf. Mesoscale Processes, J11–J15: American Meteorological Society, Fort Lauderdale, FL. Slater, A. G., Bohn, T. J., McCreight, J. L., Serreze, M. C., and Lettenmaier, D. P., 2007, A multimodel simulation of pan‐Arctic hydrology: Journal of Geophysical Research, Biogeosciences, 112(G4). Sun, S., Jin, J., and Xue, Y., 1999, A simple snow‐atmosphere‐soil transfer model: Journal of Geophysical Research, Atmospheres, 104(D16), 19587-19597. Taylor, K. E., 2001, Summarizing multiple aspects of model performance in a single diagram: Journal of Geophysical Research, Atmospheres, 106(D7), 7183-7192. Yang, Z. L., Dickinson, R. E., Robock, A., and Vinnikov, K. Y., 1997, Validation of the snow submodel of the biosphere–atmosphere transfer scheme with Russian snow cover and meteorological observational data: Journal of Climate, 10(2), 353-373. Warren, S. G. and Wiscombe, W. J., 1980, A model for the spectral albedo of snow. II: Snow containing atmospheric aerosols: Journal of the Atmospheric Sciences, 37(12), 2734-2745. Wrzesien, M. L., Pavelsky, T. M., Kapnick, S. B., Durand, M. T. and Painter, T. H., 2015, Evaluation of snow cover fraction for regional climate simulations in the Sierra Nevada: International Journal of Climatology, 35(9), 2472-2484.